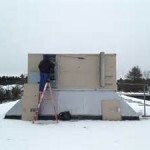 We service & install, & service most types and brands of airconditioning that you see in the field today. Namely the Airconditioning & Cooling side:- York, Daiken, Carrier, Trane, Aaon, McQuay, Goodman, Lennox, On the more specialized sizes like Liebert, Temptrol, Governair, DesertAir, Dectron. On the heating side – Knight /Levnor, Lennox, Trane, Reznor are some of the popular ones. All Chillers except low temp. We also do U.V. installations for labs and sensitive locations. If you have a problem area or a need please give us a call for a evaluation. So no matter what unit you have and even if you are not sure we can take care of it for you. Our tech’s are regularly at school, being kept up to speed and they have many years knowledge for those units. Our only brand of product /equipment we offer is in Building Automation – called American Automatrix & also ASI.